A neighbor stopped by the other day who was babysitting for his daughter's puppy. I was outside with Max and Ben, and he thought the boys would enjoy saying hi. He broke a dog treat in half and held it out to Max to give to the pup. It was a very small piece, and Max struggled to grasp it. Max does not have a typical pincer grasp, that ability to clutch an item between your thumb and forefinger that typically develops during infancy. Cerebral palsy can make your fingers stiff and hard to manipulate. So, he's developed his own kind. He'll position objects between his thumb and his index finger, then mash them together. It doesn't work so much with tiny objects like paper clips or coins. Max kept trying, but I could see that he knew he couldn't pull it off. "Max, want some help?" I asked, and when he nodded I picked up the treat and held it out to him so we could co-hold and get it into the dog's mouth. Times like this make my heart hurt. It is not a matter of pitying Max for having CP, because I left pity in the dust years ago. I am well aware of his many abilities, as I regularly share here (see: yesterday). It's that mom instinct of wanting your child to be able to do things they want to do, and seeing them fail. Max has developed a lot of work-arounds for his fine-motor-skill challenges, yet at times grasping stuff evades him. Meanwhile, in a split-second Ben picked up a treat and fed it to the puppy. The next day, Max arrived home from school with a baggie of Cheez Doodles. He said his teacher had sent them home. I wasn't sure why but, hey, Cheez Doodles! Max is a fan. Our speech therapist used to place them on his back molars during sessions so he could practice chewing. It had been a while since he'd had them. I spread a few out on a paper towel. "Max, you want me to help you?" I asked. He'd never had success holding them before. Max said no. And then he proceeded to pick one up and eat it. And he kept doing it, clutching the Doodle between his index and middle finger. 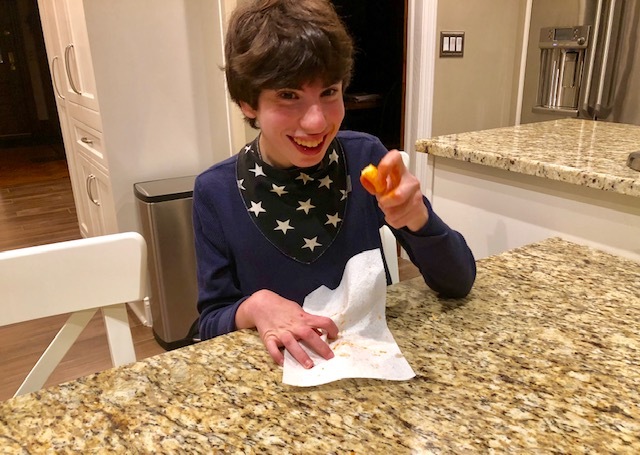 I was kind of worried he'd gnaw on his fingers, and at times he was holding onto a Cheez Doodle for dear life, but he did OK. Oh, the beautiful sight of that bright orange dust all over his fingers! Once again, Max figured out a way. Once again, I witnessed an inchstone not to be found in any developmental book. ("Teen will eat Cheez Doodles!!!"). It was a reminder that just because Max can't do something at this point, it doesn't mean it won't happen someday. It's pretty amazing that the progress has never stopped. I have a feeling it never will. I love your blog. My 3 yr old daughter has cp, reading max’s story has given me so much hope, happy thanksgiving! !